This is what it looked like when I set it aside, I don't know when.﻿ I was only a few rows from turning the heel when I started ignoring it. I don't know what Opal collection this is from, but it's got to be from more than a couple of years ago. The color is #516. Now, I'm proud to say that I'm working on sock #2. You can see little pins on the right side of the sock. I place these every 10 rows. 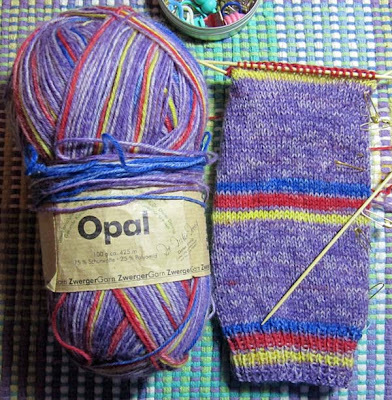 It helps me to make sure that my socks line up when I work the second sock. If row 30 is a yellow row on sock #1, then I try to make sure that row 30 on sock #2 is also yellow. I know. I know. Finishing is such a cool feeling!! I would do the same thing--it would drive me nuts if these stripes didn't line up EXACTLY. Good tip about the pins!